It is amazing how quickly the NFL season goes by. A handful of teams will officially be halfway done come this Sunday. There are some hot tickets for games this week, including one with a little international flavor. Here are the top matchups for Week 8 of the NFL season. The Steelers/Saints Halloweeen showdown takes the top spot easily, with an average price near $300. Night Games in New Orleans are usually great experiences all around. Here, you not only have a night game in New Orleans, but you have the last two Super Bowl Champions playing on the same field, not to mention the Steelers on the road, which usually bumps up the price of any game when they are the visiting team. This game is really the perfect storm. Randy Moss’ return to New England may not be the headline of the game anymore, due to Favre’s next edition of “Will he? Won’t he?”, but that doesn’t mean that fans are not paying a lot of money to go for that game, as it checks in at number two. The Londoners might be getting an awful game between two teams a combined 3-11, including one that just lost 59-14, doesn’t mean that it is not attracting attention in England. However, this is the lowest average ticket price for any London game so far, but it shows that London can be a good source of revenue for one game. The usual suspects are all at the bottom. 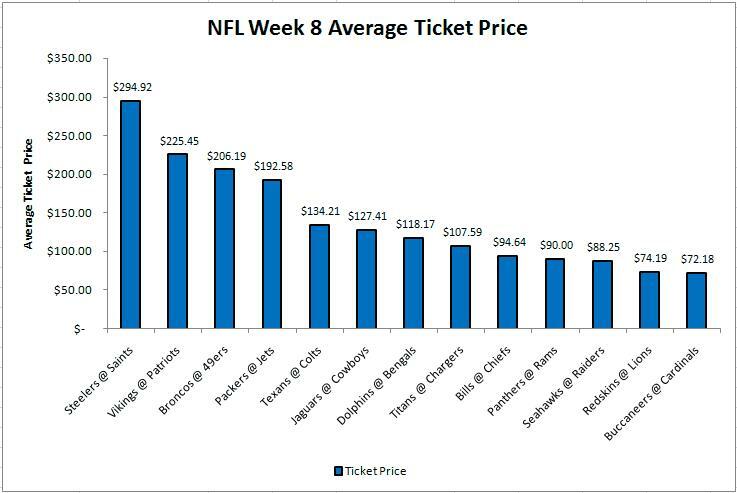 The only partial surprise is the Lions, who I would have guessed would have had inflated ticket prices due to the return of star, young QB Matt Stafford this week. Also, since the game features a 3-3 team hosting a 4-2 team, it is a little surprising that the list is bottomed by the Buccaneers visiting the Cardinals. That number is significantly less than either of the Cardinals first two home games, against the Raiders and Saints. Night Games aren’t always boosts. The Monday Night Game, featuring the 4-2 Texans visiting the 4-2 Colts has a surprisingly low average, given the stakes of the game, and the usual prices for Colts games. This may be a reaction to the Dallas Clark news, or a bye week factor. We’ll investigate this, and also see if having a night game really helps with ticket prices. Enjoy the games this weekend, amidst all the Halloween-ness going around. It should be a fun weekend, on the field and off. Thoughts or comments? Leave one here or contact us on Twitter (@SeatGeek). ‘Till Next Time.